THAT’S IT: Adam James Steere giving instructions to the Sarawak Fire Horse players during a recent training session in Miri. KUCHING: Sarawak Fire Horse’s new coach, Adam James Steere, is all set to inject an Australian style of play into the team as he prepares them for the new season of the Malaysian National Basketball League (MNBL) in September. 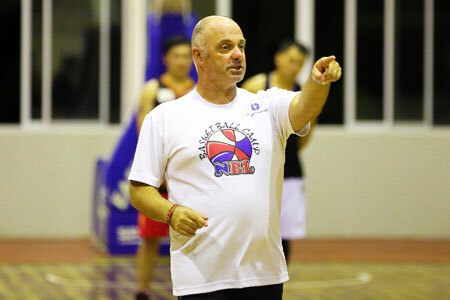 The experienced coach from Australia, who replaced Filipino coach Nomar Angeles Isla recently, said he has done some homework on the way Malaysians play basketball and has also watched the national cagers in action. Steere said the Aussie style of play is quite different from the Malaysian style especially in the defence where the strategy of man-to-man marking varies. He will be using the simplest methods to let his team players understand and adapt to the new style of play. After arriving in Miri about two weeks ago, Steere has also conducted a training workshop for Sarawak Fire Horse where the players have learned some basics of the Australian style. Meanwhile, Sarawak Fire Horse will represent the state in the 55th Maba/Agromate Agong Cup National Basketball Tournament to be held in Tawau, Sabah, from Aug 10-17. After successfully gaining promotion to Division One in last year’s competition, Sarawak’s men are drawn with Sabah, Johor, Penang, Melaka and Police this year. Steere will be using the Agong Cup as a warming up tournament for the Fire Horse in preparation for MNBL 2013 that will kick off in the first week of September.